Lahars are mudflows that contain at least 60% volcanic material (ash and debris from previous eruptions included). They originate high on a volcanic edifice, have the density of wet concrete, and follow stream valleys at speeds up to 30 kilometers per hour. Lahars are perhaps the greatest volcanic hazard in the Southern Puget Sound region. This is because the stream channels there have headwaters at the lahar-prone Mt. Rainier. Mt. Rainier is very steep and is prone to landslides which may trigger lahars, even when no eruption is occurring. However, the largest lahars are usually associated with volcanic unrest. A similar hazard that may occur in our region are glacial outburst floods, also known by the Icelandic term "jökulhlaup" (pronounced "yo-kul-h-loip"). These are much more fluid and move faster than lahars and most tend to remain within or close to the stream channel. However, larger glacial outbursts are quite dangerous, and can destroy bridges, campgrounds, and structures. Because outburst floods are unpredictable, you should be alert when visiting valleys with glacier-fed streams, particularly on unusually hot or rainy days. If you are near a stream and hear a roaring sound coming from upvalley or note a rapid rise in water level, move quickly up the stream embankment, away from the stream channel and to higher ground. Do not try to escape by moving downstream; debris flows move faster than you can run. The Nevado del Ruiz eruption and lahar in 1985 brought the danger from lahars world-wide attention. The lahar proceeded in three major pulses. 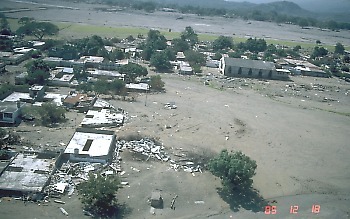 One of the lahars virtually erased Armero; three-quarters of its 28,700 inhabitants were killed. The first lahar was 30 meters (100 ft) deep, moved at 12 meters per second (39 ft/s), and lasted ten to twenty minutes. Traveling at about 6 meters (20 ft) per second, the second lahar lasted for thirty minutes and was followed by smaller pulses. 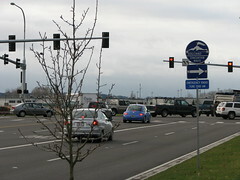 A third major pulse brought the lahar's overall duration to roughly two hours. By that point, 85 percent of Armero was enveloped in mud. 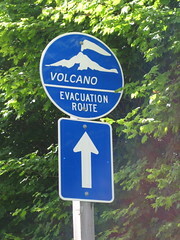 Pierce County has mapped and installed signs for volcano evacuation routes in case of lahar. A warning system triggered by sensors on the mountain near the Carbon and Puyallup River channels will activate sirens to warn residents downstream. You can see a map of the evacuation routes at the Pierce County Emergency Management website. There has also been a hazard map created from past lahar activity for the region possibly impacted by a lahar from Mount Rainier. For even more information on lahars, visit the Cascade Volcano Observatory page on lahars and debris flows.